Biryani is the famous one pot meal that many people loves to eat..Biryani is mostly loved by Arab and Asian countries like Pakistan,Indian,Bangladeshi etc..Biryani do differ from country to country..It is believed that Biryani is introduced by Mughals in India.There are many types of Biryani in India too: Bombay Biryani, Hyderabadi biryani, Thalasherry biryani, Calcutta biryani etc..Among the biryanis, Hyderabadi biryani is the tastiest and famous in North India and whereas Thalasherry biryani is famous in South Kerala...Preparation of spices do differ in most of the states in India..But the process of preparing the biryani is almost same..
As I said earlier, most commonly used in meat biryani is Chicken,Mutton,Beef and seafood biryani like prawns,fish etc are used ( Will share the recipe for the coming post)..There is vegetable biryani too,which I am sharing now..I think Malabar version of vegetable biryani is rarely prepared as most of them love non-veg version..But its tasty too..You can serve it with raita( yogurt mixed with vegetables) or pickles or any other side dish like chicken fry,fish fry,chilli chicken etc..My hubby is not much fond of vegetable biryani , I loved it :).. He is happy when I serve a side dish with Green Chicken Fry as I post earlier..Sorry for delaying the post of this recipe..
Pressure cook the Green peas( if fresh) for 2 to 3 whistles till soft..Boil or steam Cauliflower or Brocolli seperately. Drain and keep aside. Add oil in a pressure cooker and add sliced onions and saute till translucent. Add turmeric pdr,garam masala powder,pepper powder ( optional) and salt and saute well. Add chopped coriander and mint leaves and saute well. Add 1/4 cup of water and pressure cook for 3 whistles..(Pressure cook without adding vegetables at this stage,otherwise veggies will be overcooked..This is done in order to get masala in pasted form). When the pressure releases, add vegetables except cooked green peas and brocolli/cauliflower.Mix it and pressure cook for 1 whistle at high flame. When the pressure releases, add cooked green peas and brocolli and mix well. Adjust salt to your taste and add lemon juice and mix well. Heat a wide large vessel( biryani pot), add ghee + oil and add one thinly sliced onion and fry till golden brown(adding pinch of sugar will caramalise faster)..Drain and keep aside. Add cashewnuts and raisins and fry till cashews become light brown and raisin puffed..Drain and keep aside. 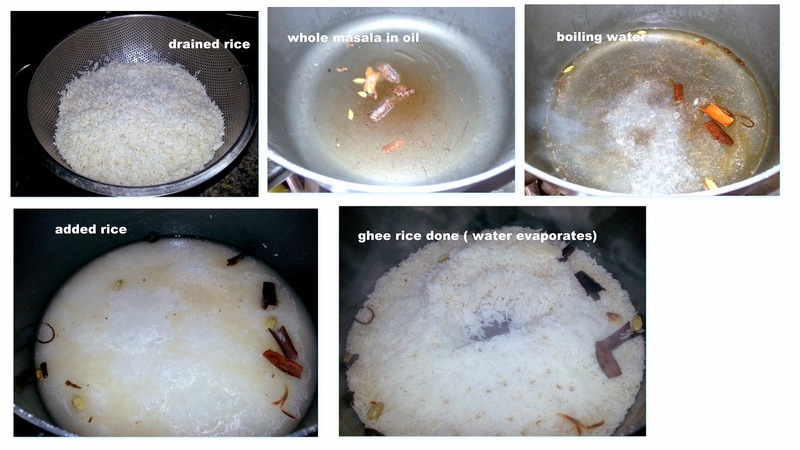 When water evaporates, immediately make into low flame and toss the rice from bottom to top. Close the lid and cook the rice at very low flame for about 5 mins. Transfer the rice into the plates,never mind if there is few trace of rice in the vessel ( biryani pot). 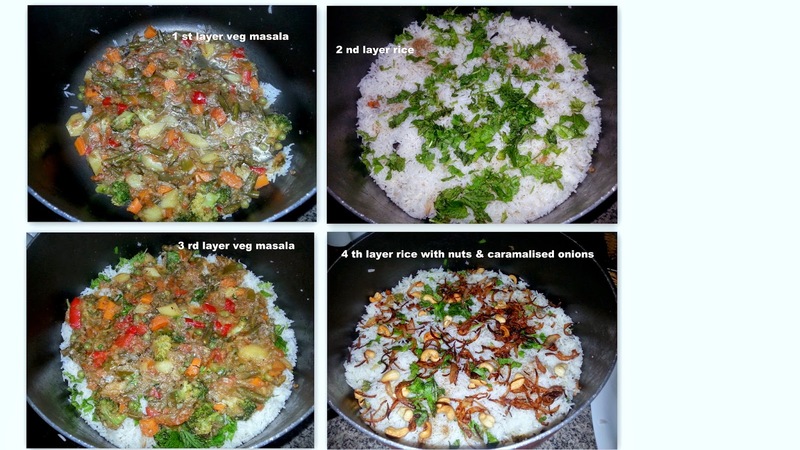 Add 1/2 of ghee rice on masala and spread in a circular motion as shown in the pic below (See pic 2). Level and press firmly with a large spoon. Sprinkle little garam masala pdr and little coriander - mint leaves ( don't add all herbs). Close the lid and cook it in a very slow flame for about 30 mins..This process is called dum. In order to prevent bottom getting burnt during dum, place tawa or steel dum platter ( Its available in most of the Indian store..It has the slotted holes for the flames to pass through). Off the flame and serve it on a plate.Take the rice from bottom to top and serve it. Serve warm with Raita or Chutneys or any other veg or non veg side dish of your choice. Biryani seemed to be lots of process to some people..But believe me, if you plan it earlier it is easy to prepare. Cutting,chopping and grinding of ingredients can be done at previous night in order to save time or if you have guests next day. 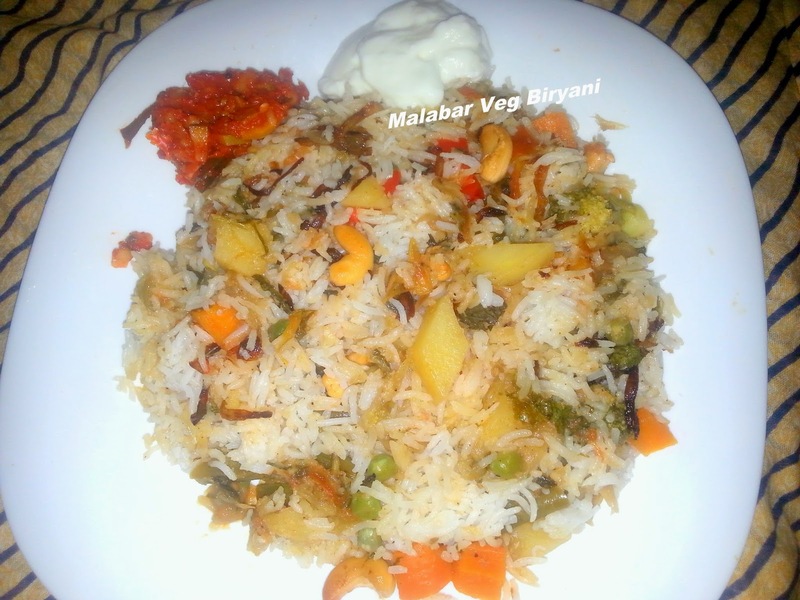 Biryani is a easy main meal to prepare if you have lots of guest. If you are in a hurry or if you don't like, ignore caramilised onions and nuts..But it taste good and looks attractive. Chicken Majboos or Chicken Kabsa. Masala Egg Bonda or Masala Stuffed Egg Fritters. Images are owned by the author, 'Fam's Culinary Recipes'. Copying or manipulating images to other sources without permission is strictly prohibited. (C)Fam's Culinary Recipes.. Picture Window theme. Theme images by belknap. Powered by Blogger.